Leading off today: Brothers Louden and Declan Porter scored 33 and 18 points, respectively as Canton pulled off the first major surprise of the NYSPHSAA boys basketball tournament with an 87-63 win over top-ranked Glens Falls in Tuesday's Class B first round at SUNY Potsdam. Declan Porter finished with 22 rebounds and Louden Porter made 15 of 16 free throws as the Bears finished 37-for-46 from the line. Louden Porter scored 18 second-quarter points as Canton built a 42-25 lead. Canton pushed the tempo hard in the second half, wrapping up the win with a 28-point fourth quarter. "We knew that if we got stops, that we could run against them," Canton coach Troy Lassial said. "And if we can turn a game into a race, our bunch is pretty tough to beat. After the first three minutes we got the stops and we got running." 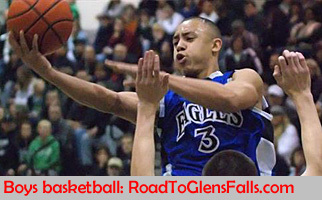 Joe Giradi III scored 38 points to lead Glens Falls, which suffered its first loss of the season. • In the opener of the doubleheader, the Glens Falls girls edged Canton 57-49 in another Class B first-round game. Sisters Sophie and Lucy Tougas scored 18 and 17 points, respectively. Another disaster averted: Mount Vernon, which gave up all of a 26-point lead before recovering to win the Section 1 boys Class AA championship over the weekend, survived another close call. Previously unbeaten Pine Bush chopped a 23-point deficit in the third quarter to four points in the fourth but couldn't quite get over the hump as the Knights walked away with a 68-59 win. "I didn't do a thing differently," coach Bob Cimmino said. "We just rocked with the players and they took us home." Senior Noah Morgan finished with 25 points, nine rebounds, five assists and three steals. Jayquan Smith, playing extensively after Greg Calixte ran into foul trouble, had nine points and eight rebounds and drew three charges down the stretch. More boys basketball: Newfield, which hasn't advanced this far since 2005, will play S.S. Seward in a quarterfinal Sunday after having advanced with a 53-36 win over Martin Luther King in Class D.
Stephen LaBarge scored 18 points and junior Quintel Clements finished with 11 points and 12 rebounds in the win. M-W's perfect season ends: UConn recruit Andra Espinoza-Hunter scored 19 of her 31 points in the second half of a 60-44 victory over Monroe-Woodbury as Ossining moved to within three wins of a fifth straight NYSPHSAA Class AA championship. Espinoza-Hunter scored 10 quick points to open the third quarter and built Ossining's lead to 37-27 over the Crusaders, who brought a 22-0 record into the game. Losses avenged: After back-to-back losses to Pine Plains in the past two state tournaments, Haldane finally advanced in the girls Class C bracket with a 47-41 win. "It. Was. Huge," Haldane's Hannah Monteleone said with the intentional drawn-out emphasis. "We've had our troubles against them the last two years but we weren't intimidated." Leading 22-19 midway through the third quarter, Haldane's Julia Rotando, Alexandra Cinquanta and Olivia McDermott made a series of 3-pointers to take a 10-point lead that settled at 32-24 heading into the final quarter. 53-50 in over Chautauqua Lake in Section 6 Class C, advancing the Bears to the NYSPHSAA quarterfinals. Olivia Lynn led the Bears with 19 points, while Iuculano had 18. PSAL boys: Thomas Jefferson, seeded 11th in the tournament will play for the Class AA championship at Madison Square Garden after dominating second seed Wings Academy 70-53. Malachi Faison led the way for Jefferson with 17 points. In the other semi, top-ranked and No. 1 seed Abraham Lincoln eliminated Curtis 72-58 as Kclejuan Ferguson connected for 26 points. CHSAA girls: Kellenberg's Clare Calabro scored six points in overtime as the Firebirds scored the first eight points of the extra session and edged St. John the Baptist 68-63 in the CHSAA Long Island girls Class A final. Calabro finished with 16 points, six rebounds and three assists for Kellenberg (12-7). St. John the Baptist (16-6) rallied from a 12-point deficit in the second half. • Kayla Robinson scored 15 points as St. Anthony's defeated St. Mary's in the Class AA final. Lauren Hackett had 13 points and Maia Moffitt added 12 points for the defending champions.